Not to be confused with pop art or plop art. For what is known as Operational Art, see Operational level of war. 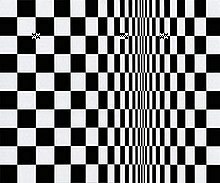 Op art, short for optical art, is a style of visual art that uses optical illusions. Op art works are abstract, with many better known pieces created in black and white. Typically, they give the viewer the impression of movement, hidden images, flashing and vibrating patterns, or of swelling or warping. Francis Picabia, c. 1921–22, Optophone I, encre, aquarelle et mine de plomb sur papier, 72 × 60 cm. Reproduced in Galeries Dalmau, Picabia, exhibition catalogue, Barcelona, November 18 – December 8, 1922. The antecedents of op art, in terms of graphic and color effects, can be traced back to Neo-impressionism, Cubism, Futurism, Constructivism and Dada. Time Magazine coined the term op art in 1964, in response to Julian Stanczak's show Optical Paintings at the Martha Jackson Gallery, to mean a form of abstract art (specifically non-objective art) that uses optical illusions. Works now described as "op art" had been produced for several years before Time's 1964 article. For instance, Victor Vasarely's painting Zebras (1938) is made up entirely of curvilinear black and white stripes not contained by contour lines. Consequently, the stripes appear to both meld into and burst forth from the surrounding background. Also, the early black and white "dazzle" panels that John McHale installed at the This Is Tomorrow exhibit in 1956 and his Pandora series at the Institute of Contemporary Arts in 1962 demonstrate proto-op art tendencies. Martin Gardner featured op Art and its relation to mathematics in his July 1965 Mathematical Games column in Scientific American. In Italy, Franco Grignani, who originally trained as an architect, became a leading force of graphic design where op art or kinetic art was central. His Woolmark logo (launched in Britain in 1964) is probably the most famous of all his designs. Op art perhaps more closely derives from the constructivist practices of the Bauhaus. This German school, founded by Walter Gropius, stressed the relationship of form and function within a framework of analysis and rationality. Students learned to focus on the overall design or entire composition to present unified works. Op art also stems from trompe-l'œil and anamorphosis. Links with psychological research have also been made, particularly with Gestalt theory and psychophysiology. When the Bauhaus was forced to close in 1933, many of its instructors fled to the United States. There, the movement took root in Chicago and eventually at the Black Mountain College in Asheville, North Carolina, where Anni and Josef Albers eventually taught. "Op artists thus managed to exploit various phenomena," writes Popper, "the after-image and consecutive movement; line interference; the effect of dazzle; ambiguous figures and reversible perspective; successive colour contrasts and chromatic vibration; and in three-dimensional works different viewpoints and the superimposition of elements in space." In 1955, for the exhibition « Mouvements » at the Denise René gallery in Paris, Victor Vasarely and Pontus Hulten promoted in their "Yellow manifesto" some new kinetic expressions based on optical and luminous phenomenon as well as painting illusionism. The expression kinetic art in this modern form first appeared at the Museum für Gestaltung of Zürich in 1960, and found its major developments in the 1960s. In most European countries, it generally includes the form of optical art that mainly makes use of optical illusions, like op art, as well as art based on movement represented by Yacov Agam, Carlos Cruz-Diez, Jesús Rafael Soto, Gregorio Vardanega or Nicolas Schöffer. From 1961 to 1968, the Groupe de Recherche d’Art Visuel (GRAV) founded by François Morellet, Julio Le Parc, Francisco Sobrino, Horacio Garcia Rossi, Yvaral, Joël Stein and Vera Molnár was a collective group of opto-kinetic artists that—according to its 1963 manifesto—appealed to the direct participation of the public with an influence on its behaviour, notably through the use of interactive labyrinths. Some members of the group Nouvelle tendance (1961–1965) in Europe also were engaged in op art as Almir Mavignier and Gerhard von Graevenitz, mainly with their serigraphics. They studied optical illusions. The term op irritated many of the artists labeled under it, specifically including Albers and Stanczak. They had discussed upon the birth of the term a better label, namely perceptual art. From 1964, Arnold Schmidt (Arnold Alfred Schmidt) had several solo exhibitions of his large, black and white shaped optical paintings exhibited at the Terrain Gallery in New York. In 1965, between February 23 and April 25, an exhibition called The Responsive Eye, created by William C. Seitz, was held at the Museum of Modern Art in New York City and toured to St Louis, Seattle, Pasadena and Baltimore. 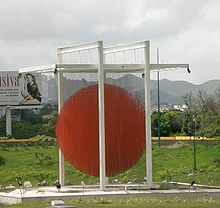 The works shown were wide-ranging, encompassing the minimalism of Frank Stella and Ellsworth Kelly, the smooth plasticity of Alexander Liberman, the collaborative efforts of the Anonima group, alongside the well-known Victor Vasarely, Richard Anuszkiewicz, Wen-Ying Tsai, Bridget Riley and Getulio Alviani. The exhibition focused on the perceptual aspects of art, which result both from the illusion of movement and the interaction of color relationships. The exhibition was enormously popular with the general public (the attendance was over 180,000), though less so with the critics. Critics dismissed op art as portraying nothing more than trompe-l'œil, or tricks that fool the eye. Regardless, op art's popularity with the public increased, and op art images were used in a number of commercial contexts. One of Brian de Palma's early works was a documentary film on the exhibition. Op art is a perceptual experience related to how vision functions. It is a dynamic visual art that stems from a discordant figure-ground relationship that puts the two planes—foreground and background—in a tense and contradictory juxtaposition. Artists create op art in two primary ways. The first, best known method, is to create effects through pattern and line. Often these paintings are black-and-white, or otherwise grisaille—as in Bridget Riley's famous painting, Current (1964), on the cover of The Responsive Eye catalogue. Here, black and white wavy lines are close to one another on the canvas surface, creating a volatile figure-ground relationship. Getulio Alviani used aluminum surfaces, which he treated to create light patterns that change as the watcher moves (vibrating texture surfaces). Another reaction that occurs is that the lines create after-images of certain colors due to how the retina receives and processes light. As Goethe demonstrates in his treatise Theory of Colours, at the edge where light and dark meet, color arises because lightness and darkness are the two central properties in the creation of color. Beginning in 1965 Bridget Riley began to produce color-based op art; however, other artists, such as Julian Stanczak and Richard Anuszkiewicz, were always interested in making color the primary focus of their work. Josef Albers taught these two primary practitioners of the "Color Function" school at Yale in the 1950s. Often, colorist work is dominated by the same concerns of figure-ground movement, but they have the added element of contrasting colors that produce different effects on the eye. For instance, in Anuszkiewicz's "temple" paintings, the juxtaposition of two highly contrasting colors provokes a sense of depth in illusionistic three-dimensional space so that it appears as if the architectural shape is invading the viewer's space. There are three major classes of the interaction of color: simultaneous contrast, successive contrast, and reverse contrast (or assimilation). (i) Simultaneous contrast may take place when one area of color is surrounded by another area of a different color. In general, contrast enhances the difference in brightness and/or color between the interacting areas. Such contrast effects are mutual, but if the surround area is larger and more intense than the area it encloses, then the contrast is correspondingly out of balance, and may appear to be exerted in one direction only. (ii) In successive contrast, first one color is viewed and then another. This may be achieved either by fixing the eye steadily on one color and then quickly replacing that color with another, or by shifting fixation from one color to another. (iii) In reverse contrast (sometimes called the assimilation of color or the spreading effect) the lightness of white or the darkness of black may seem to spread into neighbouring regions. Similarly, colors may appear to spread into or become assimilated into neighbouring areas. All effects tend to make neighbouring areas appear more alike, rather than to enhance their differences as in the more familiar simultaneous contrast, hence the term reverse contrast (Jameson and Hurvich). Note that in the interaction of color the constituent colors retain much of the own identity even though they may be altered somewhat by contrast. L'oeil Moteur, art optique et cinetique 1960-1975, Musee D'Art Moderne et Contemporain, Strasbourg, France, May 13–September 25, 2005. Op Art, Schirn Kunsthalle, Frankfurt, Germany, February 17–May 20, 2007. The Optical Edge, The Pratt Institute of Art, New York, March 8–April 14, 2007. Optic Nerve: Perceptual Art of the 1960s, Columbus Museum of Art, Columbus, Ohio, February 16–June 17, 2007. Bridget Riley has had several international exhibitions in recent years (e.g. Dia Center, New York, 2000; Tate Britain, London, 2003; Museum of Contemporary Art, Sydney, 2004). Although being relatively mainstream, photographers have been slow to produce op art. In painting, Victor Vasarely and Bridget Riley were producing large amounts of art and the same can be said for many digital artists, such as Akiyoshi Kitaoka. One of the primary reasons for the lack of photographers doing op art, is the difficulty in finding effective subject matter. László Moholy-Nagy produced photographic op art and taught the subject in the Bauhaus. One of his lessons consisted of making his students produce holes in cards and then photographing them. ^ a b c "The Collection - MoMA". The Museum of Modern Art. Retrieved November 5, 2017. ^ Jon Borgzinner. "Op Art", Time, October 23, 1964. ^ "Op-Art: History, Characteristics". www.Visual-Arts-Cork.com. Retrieved November 5, 2017. ^ "A Brief History of the Terrain Gallery". TerrainGallery.org. Retrieved November 5, 2017. ^ Seitz, William C. (1965). The Responsive Eye (exhibition catalog) (PDF). New York: Museum of Modern Art. OCLC 644787547. Retrieved January 23, 2016. ^ "The Responsive Eye" (PDF) (Press release). New York: Museum of Modern Art. February 25, 1965. Retrieved January 23, 2016. ^ "MoMA 1965: The Responsive Eye". CoolHunting.com. Retrieved November 5, 2017. ^ Brian De Palma (director) (1966). The Responsive Eye (Motion picture). ^ Hopkins, David (September 14, 2000). "After Modern Art 1945-2000". OUP Oxford. p. 147. Retrieved November 5, 2017 – via Google Books. ^ Floyd Ratliff. "The Theory of Color and the Practice of Painting," in 'Color Function Painting: The Art of Josef Albers, Julian Stanczak and Richard Anuszkiewicz', Wake Forest University, 1996, p. 8. Seitz, William C. (1965). The Responsive Eye (exhibition catalog) (PDF). New York: Museum of Modern Art. Wikimedia Commons has media related to Op art. Look up op art in Wiktionary, the free dictionary.